An elegant apartment in Florence, situated in the center, from where you can enjoy the history of this magical city, with a breathtaking view on the dome of the Cathedral. It is an excellent option for 2 people who want a private and comfortable accommodation while being located in the central position to experience and explore the city. It is finely decorated in modern Italian style, creating an ideal combination of tradition and modernness. It features cosy living room with fireplace, dining room with kitchenette and one bedroom with queen-sized bed. Also, in between the rooms, you will find an in-room micro pool for private moments of relaxation, providing various types of treatments. Since the apartment is located on the top floor, there is an elevator which arrives to 5th floor and there are about 15 stairs to do before reaching the apartment. The Speziali Exclusive apartment is located in the same building as the apartments Speziali Exclusive 2, Speziali Exclusive 3 and Speziali Suite. ON REQUEST - ASK FOR AVAILIBILITY. For cancellations within 30 days prior to the arrival day we charge the 40% of the total amount. For cancellations within 15 days prior to the arrival day we charge the 80% of the total amount. Cancellation on the arrival day or no show we will charge the 100% of the total amount. A 15.00% of total price is charged on your credit card for all reservations. Credit card payment is subject to a 4.00% fee. City tax : 2.5000 € per night and person will be added to the total price. The city tax will apply to a maximum of 7 nights. The city tax does not apply to those under 12 years. The apartment Speziali Exclusive is located in Duomo area. Speziali Exclusive apartment in Florence has an amazing location, just in the center of romantic city. It is situated on the top floor of the famous Palazzo Levi in Piazza della Repubblica. This part of Florence is embossing with art, architecture and Italian culture, with just a small walking distance from different Florentine sights such as Cathedral (Duomo), Uffizi Gallery and Piazza della Signoria. Just behind Piazza della Repubblica you can find various charming sites which will take you to the Sante Croce Cathedral. There, on every corner, you can hear the music and smell the specific aroma of rich Italian cousine, creating the unique ambient of Italy's magic. The apartment is located on the perfect spot for enjoying this magnificent Reinassance city where you can truly experience the ideal combination of Florence history and modern vanguard interior designs of the apartment. Brunelleschi Dome - 0.28 km. Santa Maria del Fiore, or simply the Duomo, is one of the largest and most famous cathedrals in Europe, whose construction began with Arnolfo di Cambio in the thirteenth century. Uffizi Gallery - 0.36 km. Ponte Vecchio - 0.39 km. The Ponte Vecchio is universally known as one of the most important spot in Florence, one of the undisputed symbol, a must see for every romantic stroll, a summer ice cream or a photo-souvenir. We’re in the heart of Florence! The cathedral area is the most visited place and crowded with tourists. Imposing, sometimes chaotic, a shopping and art Mecca, including the Piazza del Duomo, the elegant Via Calzaiuoli, which directs you to Piazza della Signoria and the Loggia dei Lanzi. From here you can start enjoying the Galleria degli Uffizi. For those who want to stay in the bustling centre of the city, an apartment in Florence Duomo is the best there is! 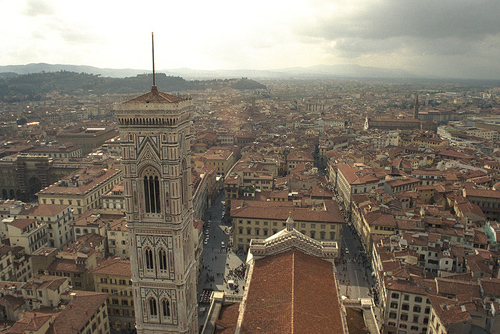 What to do in Florence? Located in the historical Palazzo Levi, this Florence apartment offers romantic atmosphere in the heart of the city. You can enjoy in the warmth of fireplace with magnificent view of Giotto's impressive bell tower and truly experience 'La Dolce Vita'.